Who wants to wake up dreading all of the lawn and housework that's waiting for them? No one, that's who. In our Independent Living villas at Forest Glen Health Campus, home maintenance is something you'll never have to worry about. Thanks to our wide range of activities and outings, your agenda will be too full of dinner dates, movie nights and afternoon strolls to fit in raking the lawn. Plus, by the time it crosses your mind, our staff will have it taken care of. We're here to take care of the chores that took up too much of your time. Now you can bond with your new friends on your patio, prep your famous potato salad in your fully equipped kitchen, and still have time to read a story with your grandkids (even if they want to hear it twice). And because our community is pet-friendly, your furry friend can enjoy this wonderful lifestyle right along with you. Imagine having an entire team of friendly people to take care of the tedious tasks you've had enough of. 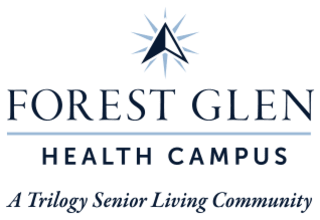 When you become a resident of our Independent Living villas at Forest Glen Health Campus, you don't have to imagine anymore. Instead, you can watch from your window as we shovel the snow in the winter, rake your leaves in the fall, and make sure your lawn stays in tip-top shape all spring and summer. We'll also wash your windows, dust those hard to reach places, and help you decorate your villa with your favorite pieces from home. So what are you to do with all your new found free time? Spend it getting to know your neighbors, pursuing the passions you never had time for, and joining us for any of the group outings and activities we plan every week. Are you ready to start living life to the fullest? Call us today and schedule a personal tour.